What is "whitelisting"? When you join our program, the Minecraft.net username associated with the enrollment is placed on a list that allows access to a server. Who can be whitelisted? Anyone can be whitelisted as long as they have submitted a paid enrollment with all of the required information. If there is inaccurate information on your enrollment, it may delay or nullify your enrollment. I should be whitelisted, but your server says I'm not. First, you'll want to make sure you submitted the correct username on your enrollment. Open your Minecraft launcher and before clicking PLAY, look to the right where it says, "Welcome, Username". We need to have that username exactly as it shows in the launcher. Once we have that, we can update our whitelist. 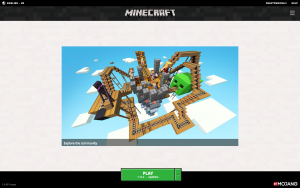 If you have just recently downloaded the new Minecraft game launcher, this is what you should see: Your username will be located in the top right corner and/or on the green PLAY button. Another reason you may not be whitelisted could be that the session in which your student was enrolled has ended. Please be sure to check the dates for the session your student last attended. If that date has passed, and they weren't enrolled in the next session, they will have been removed from our whitelist. Type in a keyword and click search. This site is not offering an official Minecraft® product. GamED Academy, LLC is not associated with Mojang or Microsoft.